What Is Plastic Injection Molding? Plastic injection molding is a common manufacturing process perfect for creating a unique product and being able to mass-produce the product upon the design. At TechTank, our plastic injection molding manufacturing provides our clients the most reliable, high-quality products available. The plastic injection molding process involves injecting molten plastic into a mold cavity where it then cools and hardens into the end product or part. Injection molding starts with an engineer designing a mold for a specific purpose. That mold design is then turned over to a toolmaker to create the mold usually from either steel or aluminum. This mold is precision machined to form the exact features of any desired widget and then used to inject molten plastic into which then forms the part. 3D printers and CNC machines are often used to prototype the part which can be used as a model to form the mold. What are the Advantages of Plastic Injection Molding? Once the initial design and mold have been completed, the price per unit for plastic injection molding manufacturing end up being quite reasonable. The ability to scale products produces via injection molding is the biggest advantage. With the price per unit almost always dropping as more products are produced, this allows retail clients to make more margin as sales increase. A spruce guides molten plastic to the entry point of the mold. This is a separate–usually custom–piece that needs to be designed for each individual mold. Runners shoot off the main spruce running the plastic to individual parts. There are both hot and cold runners depending on their purpose in the mold. The gates connect from the runners and hold the product to the main assembly. This is the final point of the molten plastic before entering the cavity. There is also a certain amount of plastic that leaks out of the injection mold cavity while filling it-a condition called flash. Flash is a molding defect where the plastic oozes usually through the parting line or ejector pin locations. When the excess plastic cools, it remains attached to the widget requiring additional work to finish the product. This can sometimes be remedied through increasing clamp pressure or regular maintenance of the mold itself. This may go without saying, but there are considerable pros to producing a product that is exactly identical every time. Whether it be for branding or interchangeable parts, consistency has its advantages. This plays off the pricing point too where large quantities of a widget can be produced to be used as a future component at a very low relative cost. Having a consistent product every time allows for this kind of cost-saving. Though if designs change, this could negatively affect efficiency if there are outdated parts laying around. The good news is almost always the raw material can be recycled and formed into a part that is now needed. Working with TechTank can help tackle many of the pitfalls to plastic injection molding and help consult whether or not the application is suitable for this manufacturing process. Many products are produced through plastic injection molding; everything from bottle caps to automotive dashboards to shopping carts are created using injection molding. Simply put, plastic injection molding is one of the most common methods of part manufacturing, but there are many parameters which injection molding needs to operate within. Below are aspects of the plastic injection molding process to consider when designing a particular product or part. TechTank is happy to help anyone interested in producing a product and is one of the services offered through the Founder’s Club Program. 3D printers are almost always used in the initial prototype development. It is important to consider whether or not a product can be created through 3D printing to create a mold suitable for the application of the end-product or part. Another design specification to consider is not only designing the product itself, but also the injection mold tool (spruce, runners, gates, etc.). The mold tool carries the molten plastic to the cavity to create the widget. Generating anything over 300 prototypes will generally require the development of the plastic injection molding tool for production. Another potentially time-consuming process is the trial and error required on both the injection molding tool and the cavity for the end-product to refine any details before mass-production. This is where economies of scale and consistency will hurt if 10,000 identically defective widgets are produced on the first mass-produced run. Take the time to create many prototypes first to avoid this pitfall. High tooling costs for injection molding can be a drawback as this is an entire project in and of itself before any thought to a mold can even be placed. Extensive testing is required, and because most tools are made out of steel or aluminum, making changes can be difficult. Keep in mind material can always be added to a mold by making the cavity larger by cutting away the metal or aluminum. But taking away plastic (reducing the size of the cavity) is a much more difficult task oftentimes requiring an entirely new tool to be produced. Starting over is where cost can become a significant factor. In some cases, welding in additional metal or aluminum to the cast is possible, but this is highly-skilled and time-consuming work. In the perfect injection molding world, the thickness of each wall within the mold would be exactly uniform. If the walls are too thick, sinkholes and other inconsistencies are more common when the plastic is cooling. Having walls too thin, however, can create gaps in the product because the entire mold is not filling properly. Walls around 4 mm thick is a good compromise and also helps to prevent waste by having walls any thicker. Anything thinner than 1 mm will generally cause problems in the injection molding process. Many products designed by injection molding end up being much larger than the injection molding machine itself. For example, a large plastic crate would need to be assembled in pieces and constructed separately after the injection molding process is complete. And sometimes it’s not so much the capacity of the injection molding machine, but more how large the CNC machine or 3D printer is to produce the prototype or tool in the first place. So large 3D printed parts also need to be printed in multiple parts and put together to create exactly what is needed for injection molding. 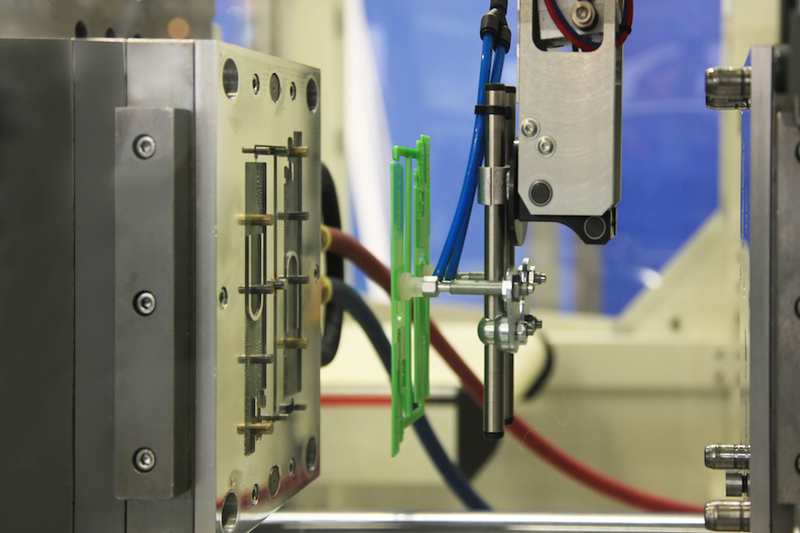 All things to consider when considering injection molding. Injection molding is marvelous technology. It allows engineers to design and create many products (or parts of products) in large quantities and thus low prices to the consumer. And though it is not perfect for every design spec ever thought of, a mold can be creatively designed to help overcome problems when designing a product. TechTank has partnered with Live Automation’s advanced collaborative robot technology to help overcome some of the labor issues and competitive pressures that impact plastic injection molding to make the process as easy as possible. Overall, injection molding is widely considered an affordable way to produce high-quality, consistent products on a large scale. 2 thoughts on What Is Plastic Injection Molding? It’s good to know that 3D printers are used for prototype development and not for making the actual product. I’m sure a different method would need to be used for that instead. It’s good to know that a mold tool can help with prototypes as well. My friend has been thinking about making a design prototype, so I’ll have to suggest he tries using plastic molding. I’m Chemical engineer working as consultant in Polymers after retirement. Please contact for questions regarding the Founder’s Club or to set up a time to tour our facility!